What is the Meaning of This Word “Hack”? According to a lawsuit filed against CoesterVMS and Brian Coester by appraiser Mark Skapinetz on April 20, 2017, Brian Coester and CoesterVMS have illegally accessed (hacked) his email accounts. The lawsuit alleges violations of the Stored Communication Act, Trespass to Chattel, and Trespass to Land, Conversion, Fraud, and Invasion of privacy. Mark Skapinetz is a Certified Residential Appraiser in Georgia that owns the Facebook page “100% Real Estate Appraisers”. This is a very active private group with over 700 members. Mr. Skapinetz has been very vocal about appraisers being treated unfairly by AMC’s and advocates for appraisers. This is not the first time Brian Coester and his company CoesterVMS have been accused of wrong doing. CoesterVMS and Brian Coester have a questionable history with the law. He was recently in a legal dispute over fraud with a former Vice President, Robert Scheer. Let’s not forget about the lawsuit Brian Coester filed against the Virginia Real Estate Appraisers Board over the licensing of CoesterVMS. Then there were the numerous state violations against CoesterVMS for noncompliance of customary and reasonable fees, late payments to appraisers, etc. Then there was the disciplinary action against Mr. Coester’s father in Virginia on a report in which Brian Coester was the assistant. These are just some highlights of Brian Coester’s questionable activities. Phil Crawford, Voice of Appraisal released a special show concerning this new lawsuit against CoesterVMS and Brian Coester. Phil does a great job of breaking it all down. Listen to the podcast here or below. Do we have a Peeping Tom?!?! Jonathan Miller also covered this breaking news in his weekly blog. See Jonathans take on the lawsuit here. See the entire verbiage of the 27 page lawsuit embedded below or, click here . According to the lawsuit, access was gained to Mr. Skapinetz’s email by malware installed on Mr. Skapinetz’s computer. This raises the valid question of how it got there. Many AMC’s have developed apps to blast orders to appraisers. Does anyone really know what they are installing on their computer, phone or tablet? Could this be the source of the malware? The use of mobile applications by AMC’s is wrong on many levels. First: It is unprofessional. Appraisers are licensed professionals with credentials that align with their education, background and experience. Each and every appraiser has passed a test to obtain their license. AMC’s merely filled out an application and paid a fee. The AMC’s lack of trained and knowledgeable employees in the appraisal process and the lack of understanding of the basic principle of real estate that every property is unique, has caused considerable harm to consumers, lenders and investors. Texting and the use of apps is simply inefficient and causes delays in assigning the appraisal to the most qualified and competent appraiser. The use of the app reinforces the “fast and cheap” business model. Sadly, the AMC’s have not figured out, or simply not smart enough to figure out, how this is counter-productive. Second: The app is not secure! Regardless of how much encryption is placed in the programming, electronic communication is simply not secure! Cyber-crime is on the rise; just ask Hillary about emails and hacking. Third: The appraisal process requires thought, analysis and concentration. Constant interruptions because of AMC texting and app dinging, is a huge distraction. This directly impacts the finished quality of the report. Fourth: The AMC is paid to “assign and manage”. Vetting of the appraiser is probably the most important part of the AMC role. This basic, but crucial function is where most AMC’s consistently fail. Their duty to the client is to assign the appraisal to the most qualified and competent appraiser, not the fastest and cheapest! Appraisersblogs published an article a while back on this very topic. See it here. Bottom line, why you install any app on your phone is only your business. We encourage everyone think it through and realize you may be giving access to your entire computer, phone, or tablet. This includes email, banking, documents, photos, etc. Protect your privacy! If the allegations are true and appraiser’s email accounts are being hacked by AMC’s, is it plausible AMC’s can and will alter your appraisal reports? Should the AMC license of CoesterVMS be suspended in each state until this case is resolved? Shouldn’t the states ensure Public Trust is protected? Geesh! 100k? / It would appear that both parties slept through the wikileaks disclosures over the past 5+ years. Per the authors question; No, innocent until proven guilty is a cornerstone of the checks and balances system. Previously I had locked everything down with the full array of ad block, pop up block, flash block, malware bytes, denial of all remote assistance, and redundant other blockers. Faith in the cloud is misplaced trust. It’s going to be tough to guess my password, 12+ long multi’s written on paper. Not storing passcodes may also inhibit hex dump and sniffing penetration. Let’s get this out of the way: I am no fan of Coester. I actually don’t mind some of the better AMCs (there are only a few), but I find Coester to be both unprofessional and non-compliant. They actually encourage the loan officer to call me if they are unhappy with my opinions. Who knew that was still going on? I do take issue with this post’s stance on mobile applications. I fully agree you have to carefully choose which technology to trust, but condemning all apps is a bit foolish. As an industry, I feel we as appraisers do a poor job with keeping up with changing technologies. This is probably why so many lenders want to take us out of the process completely. For our industry to continually thrive, I believe we need to embrace responsible technology when it arises. I disagree with Anon. There is no way you can do the proper research on a property when an address is blasted to you with an accept or decline. As the appraiser, it is not only wise to know what you are getting into, but it is the only way you will know if you are competent to complete that assignment. The use of these apps to broadcast orders just reinforces the fast and cheap business model. I can not speak for others, but I consider myself a professional. I take pride in my work and do the best I can for my client. I use technology all day long and most have been great tools. The AMC model of fast and cheap is not professional and actually is harmful to public trust, the only reason appraisers are licensed! The AMC app is designed for fast and cheap. Communication with the client is essential for a success appraisal report. The AMC’s do not understand the appraisal process and are of no benefit to appraisers or consumers. Anon said; embrace responsible technology. So foxconn slave labor iphones and rampant chemical and precious metal ewaste products with money flowing straight into the communist red state is what you consider responsible technology? Don’t worry, the majority of Americans are similarly detached from reality when they get those nifty computer in a box items in hand. Responsible technology would be technology for the better of all parties, not just the corporations developing and selling. Apps have been and will continue to be an utter waste of time, a clever way to monetize what should otherwise have been ready and free cross platform technology sharing now that we’re more than half way through Moores Law and processor compression. Good business practice still requires humans to treat other humans with respect. Broadcast distribution apps being just one of many examples of obviously disrespectful and irresponsible business practice. You’ve got mail. Get your runner to accept, inspect, and write most of your work up for you. You would be half way to being an amc, money for nothing, no meaningful oversight, and illusions of compliant ethic. Did you hear the one about the guy with a major brain tumor in another country, and how the courts ruled it was the long term cell phone use beyond recommended limits of only a half hour a day which caused it? Yes, that actually did happen, and it’s the tip of the ewaste iceberg. I wrote personal letters of appeal to coester and other amc’s. All I got in return was a continued stream of lousy broadcast request which went directly into the spam and trash can. If AMCs had to pay for “bids” or “proposals” not accepted this would eliminate broad casting for the cheapest and fastest reports. AMCs should have to pay for canceled reports as well as a minimum of 50% the fee for trip charges. If you are in need a great laugh this morning read the latest article on appraisalbuzz.com Written by yet another appraisal business hand me down recipient. Ah to live in the real world! But it’s way better to hear your take on it dude. Please, inquiring minds want to know. I’m certainly not bouncing that website though. I am confused, on the one hand this guy thinks AMC’s are holding appraisers hostage on facebook and on the other he is completing orders for one of the most corrupt AMC in existence today. My conclusion, Mark has what’s coming to him and should have known better…. Wow. Really? He’s got what’s coming to him? Is that some kind of threat? What’s going to happen? Also, how do you know he’s completing orders for them? Please elaborate and tell us all you know and where you get your info. I’m very interested in this suit against Coester; the allegations are pretty serious. Tim – That information is incorrect. Mr. Gioia’s expiration date is 2/28/2021. My source is the current ASC National Registry. I don’t agree with him regarding Mark, but since when do we all have to agree on anything? Mike, you are commenting on a thread that is a year old. True. I often go back and comment when my email notes new posts and links to them. In any event, I get the impact of the date on license status you posted. Wasn’t being critical Tim, merely updating the information concerning his license status. 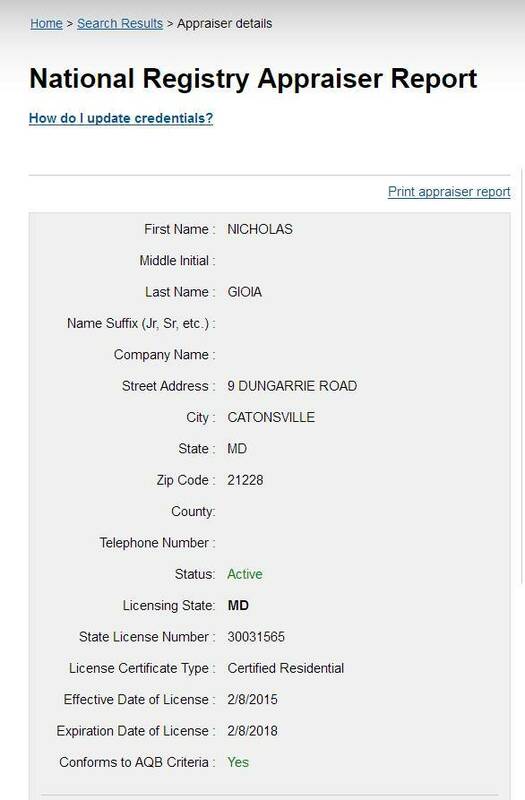 Ahhh so he’s in MD? Agreed. I prefer the amc’s whom use the out of the box subscription technology. When I see custom web development suites, alarms start ringing. Like just send me an email and quit making a big top circus show about every regular appraisal order that gets assigned. His OWN WORDS in the lawsuit he filed again Coester. Details of Suite posted in appraisersblogs.com. Because I am in MD? You are in CA, good luck with that. They don’t pay their fee appraisers. I would recommend NOT taking an assignment from them. I have been trying to get paid for (3) months. There are other much better AMC’s to work for. Run don’t walk from Coester VMS. Finally. I had to use a collection company. Wow, thanks for the info! do you know if this only applies to appraisers in Virginia? Contact your state AMC regulatory agency and ask if they have laws dealing with this. If not, then write the Lender-CLIENT and tell them you want your money. Thank you Sir. I’ve sent out letters to the attorney & bank. Yes, I contacted the bank and attorney that was shown in the letter and they told me they have nothing to do with paying the invoices. So still screwed I guess. Over $5,000 owed to me. Alternatively turn it over to a collection agency. Can you send me the information? I have tried for months to get paid by Coester, to no avail. Any information you can provide would be greatly appreciated. Previous story Who is Mark Skapinetz? AMC Who is Mark Skapinetz?